Homefront: The Revolution had a fairly troubled development history. After the first game in the franchise released to a mixed reception, the IP was first sold to Crytek and then to Deep Silver, where it sits right now. The good news is that the last transition was smoother, since Deep Silver also acquired Crytek UK (which was developing Homefront: The revolution) and renamed it to Dambuster Studios. At Paris Games Week, I’ve had the chance to speak about the game with CJ Kershner, Senior Narrative Designer. After the previously posted little snippet, it’s time for the full interview, available both in text and video form (and this time around, the audio is actually decent, so you can choose freely). 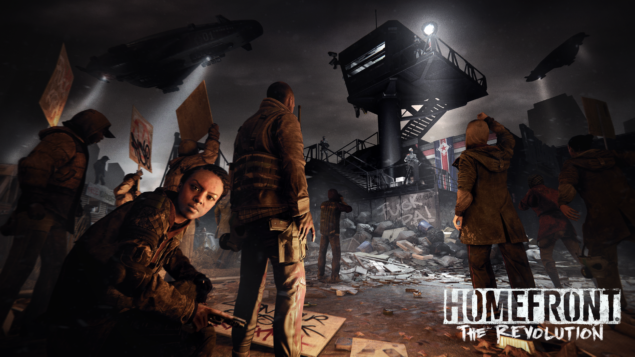 Homefront: The Revolution, still powered by CryENGINE, is scheduled for release next spring for PC, PlayStation 4 and Xbox One; a closed beta for the multiplayer mode will take place at some point in the Winter season. Enjoy! What changed, if anything, when Deep Silver acquired Dambuster Studios (formerly Crytek UK)? While I wasn’t there for the transition, there wasn’t the sort of turbulence that perhaps people on the outside perceived happening. The team working on the game now is the same team that’s been on this title since its inception as a project back at THQ. How long has Homefront: The Revolution been in development? It’s been in development for about four years. It originally began as a direct sequel to the first Homefront. It was, like the first game, a very linear, scripted, corridor shooter; when the studio acquired the rights to the IP, they decided, given the system that we want to feature, the story that we want to tell and the fantasy of being a guerrilla fighter, does it make more sense to make it open world? And the answer was, absolutely. That previous version was scrapped and they began anew. The game which is now playable at Paris Games Week is much more open, much more system driven and I believe really leverages that fantasy of being a guerrilla fighter. Because when you’re in a corridor shooter, you encounter a group of enemies and the only direction where you can move is forward, so you kill everyone on screen and you keep going on a rollercoaster, whereas when you have an open world you can choose to attack from any direction. Part of that guerrilla fantasy is that we want you to feel vulnerable, we want you to be afraid, we want you to feel like you might not win every firefight you get in, so you pick your battles very carefully and assess your environment for the best tactical advantages. If I see a patrol coming down the street, maybe it doesn’t make sense to just open fire, maybe I should climb up to a second floor window and wait them to pass. So there are more tactical options. Many more tactical options! The other interesting thing is that unlike other games in the open world FPS genre, our system is designed so that when reinformcents arrive, they’re overwhelming. It starts off with a couple of soldiers but rapidly there are drones, vehicles, airships hovering over your head. When you’re spotted, you quickly realize that your position is untenable, you can’t stay there; so, you run away. Running away is not something that you do often in first person shooters, and again thanks to it being open world and in part because you’re making all these tactical assessments of the environment, you will know, “Okay, I have a firescape behind me that leads to a roof that leads to another roof and then down to the sewer, so if things go south and I can’t win this fight I’ve got four or five directions that I can escape to”. It leads to a very different and interesting style of gameplay where you hit a target and then evacuate the area as quickly as possible. Let’s say you are on a mission and you decide to escape, what happens then? Do you have to do it again from the start? No, not at all. Even within our demo here at PGW, we start the player in a mission to give him some context and some concrete objectives to take in order to introduces them to the style of game play and the world; however, players can approach those objectives from any direction and using any of the tools that we’ve provided them. You do have to complete that first ambush, but once you’re there you can navigate to the second part of that mission any way you want. In fact, there are about five or six different ways that I can name. When you encounter a group of enemies and you run away, that doesn’t feel the mission, that just means you’re now taking a different course to that objective and that happens fairly frequently throughout your playing of the game. We present the player with a lot of small obstacles, like micro-challenges, and again, give them a lot of tools and ask them to make a tactical decision to overcome it or get around it. Sometimes not engaging in combat is the best option. If you see a patrol and you know you can duck in an alley or a building and not deal with them at all, that’s a totally valid strategy. How big is the city of Philadelphia? It’s sort of difficult to assess how big is it in terms of size. The way the world is broken up is in various zones: we have red zones, yellow zones and green zones. The red zone we have here is much more of a bombed out, sort of chaotic area where the enemies, when you encounter them, will shoot on sight: it’s been declared off limits. That leads to a lot of unscripted gunfights in the streets, those sort of crazy chases where you got vehicles pursuing you through buildings and you’ve got the motorbike to take it up on the streets or up on the rooftops if you want. Then in the yellow zones, it’s much more of a cat and mouse style of gameplay where their first declaration is not to shoot on sight, but to come over and investigate; there’s many more civilians in the area. You’re using a bit different style to accomplish your objectives, you don’t even want to have a gun drawn because then you send everyone running in fear so you do more of sneaking through apartments to get to the roofs. If you get spotted you’re chased and you have to hide or escape that way. The green zones are where we have our setpiece missions and we have the landmarks of Philadelphia like Independence Hall, the Liberty Bell; that’s the heart of the occupational administration and it’s where the most valuable targets are located, but also the toughest part of the city to break into. Players will find travel options to travel between those zones using subway tunnels, sewers or tunnels that the resistance has dug; they’ll start from a red zone, crawl down a tunnel and pop out in a yellow zone which will be completely different in terms of art style, architecture and even the gameplay. Without spoiling it too much, can you tell us a little bit about the story of the game? It’s hard to talk about it without spoiling it too much, but the players are in the boots of a resistance fighter named Ethan Grady and obviously the goal is to liberate Philadelphia from the North Korean occupation. It’s not the North Korean military that we know from the news today, we’ve gone back in time and changed a number of key historical events that sort of branch out in the timeline, which leads us to this point where North Korea is technologically and militarily far more advanced. By performing these missions and a number of smaller actions, sabotages, you will weaken the North Korean stranglehold of the city and inspire the population to rise up alongside you. How long will it take to complete the story approximately, in terms of gameplay hours? Again, it’s difficult to say right now exactly how long the campaign will take to complete. I will however say that I’ve been demoing this one small section of the game for a few months now and every time I have a free moment and play it, I’m constantly finding new things I didn’t know were there that the designers have added, small things that have changed, and my hope is that when the game is released in spring 2016 it’s not so much about how much time the campaign offers, rather how much you want to spend playing it. Hopefully, our systems and story are compelling enough that you will want to spend quite a bit of time. Does the game have a day/night cycle? We have that, we have a dynamic weather system as well and one of the smaller touches that has absolutely no gameplay value is that, when it rains, there are puddles that form in the street and then when the sun comes out those puddles slowly dry up. It’s hard to encourage players to just stand there and watch water evaporating, but it’s one of those little touches that we’ve added that really makes the city feel very vibrant and dynamic and alive. We’ve also got a lot of other interesting things going on with our rendering, with our particle system; the goal is that every time a player enters an area, whether it’s day, whether it’s night, whether it’s raining or it’s foggy or clear, you get a very interesting and visually arresting scene as your playground. Does Homefront: The Revolution have Physically Based Rendering? We do have Physically Based Rendering. Some of the more technical aspects I’m not totally up to date, but we’re constantly adding new things to CryEngine 3 and optimizing it to really get the most of all the hardware that we got available. Can you tell us what kind of frame rate/resolution you’re targeting for the console versions? We’re targeting 30FPS on consoles and on PC it’s whatever hardware you’ve got that you can through at it. We’re obviously constantly optimizing the engine and again, like I said, trying to make the most out of the hardware; those numbers shift depending where we are in development, but our final target is 30 on consoles. And the resolution will be FullHD? As far as I know, it will be FullHD. Is there anything you can tell us about multiplayer? I’m happy to talk about multiplayer because we have announced a four player cooperative experience. You and three of your friends can join together, form a little resistance cell and create your own resistance fighter, go out on narratively driven missions where you use the same tools and tactics that you use in the single player campaign. You can acquire new gear, come back, maybe switch a few strategies and eventually become heroes of the revolution. I’m really looking forward to playing it myself and have others join me, we’ll have a closed beta this Winter and more information on how you’ll get into that will be available in the coming weeks. It’s so much fun to have that cityscape and all of those options available to you and three of your friends there, whispering in the headset “Okay, you want to play as the sniper so we’re going to do this quietly” and you do it and then it maybe fails or not; you come back and you’re like, “Okay, new plan, I want to get on the motorbike. Is multiplayer only cooperative or is there a competitive side? Can you do the entire campaign of Homefront: The Revolution in coop? It’s a separate experience from the campaign, but it uses all of the same elements you find in the single player.